All three of Eiichi Kudo’s groundbreaking samurai films (“13 Assassins” featured last week and “Eleven Samurai” to come shortly) contain that same warning. All three do indeed contain violence and strategy as advertised, but in this second film of the loose-knit trilogy, released in 1964 and regarded in Japan as Kudo’s masterpiece, violence and strategy overlap dramatically, sometimes crudely, but always effectively. An affable samurai named Jimbo (played by Kotaro Satomi) relaxes in his bath, his wife scrubbing his back. However, less than 30 seconds later, his house is full of swinging sword blades, and in short order, his wife falls to her death into the mud outside the house. Eiichi makes much of rain and mud in this film, contrasting the warm, comforting, but all-too-rare respite of the bath, with the chaos and turbulence outside in the real world. The carnage and muddy chaos concerns an uprising of oppressed farmers who have finally snapped at having most of their harvests confiscated by the powers that be, with some samurai secretly joining them. As the film opens, imperious Lord Saki (Ryutaro Otomo) orders the “gang,” as he disdainfully refers to them, to be rounded up. Torture, execution, and defilement await those captured. Flushed from his home, his wife slain, Jimbo finds shelter in the home of Matonoshi Asari (Mikijiro Hara). Matonoshi was once a reputable samurai, but he’s dropped out of respectable society, borrowed much more money than he can pay back, and lives from skimming off the proceeds from the gambling house he’s opened in his front room. Matonoshi feels no need to exert himself, and his lassitude gets on Jimbo’s nerves. The two men debate over what is important, what needs to be fought for, and make for some of the film’s most intense moments. Quiet, but fraught with tension, cinematographer Osamu Furuya’s camera follows the two through long, dark rooms. The climactic battle, fought largely in water, echoes the rain and mud of the film’s opening. 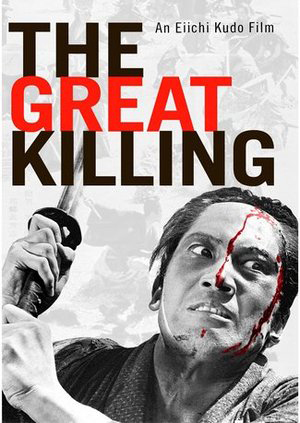 Visually, “The Great Killing” proves much more varied than its predecessor, “13 Assassins.” Kudo emphasizes the differences, and sometimes the similarities (darkness, eeriness) of indoor and outdoor shots. He arranges his characters in elaborate visual constructions, shifting them between visual planes that recall the opening and closing of traditional Japanese sliding doors. His “gang” members, including a deranged, homicidal monk and a brilliant female co-conspirator fighting with swords, and intrigue, keep the narrative percolating. Some of Kudo’s touches came from contemporary sources, although many audiences do not realize this. For that climactic battle scene, he mixed in tapes from modern-day Japanese riots, complete with police sirens audible faintly in the mix. One crucial scene at the end involves one man against many, a last-ditch, frantic stabbing after the struggle would seem to be decided. A war cry and a wild slash out of nowhere. American audiences might recall the killing of Lee Harvey Oswald, the accused assassin of John F. Kennedy, by Jack Ruby in 1963. But a more direct Japanese reference, as reviewer Paghat the Ratgirl points out, is the notorious televised killing of politician Inejiro Asanuma by Otoya Yamaguchi in 1960 … a killing carried out with a samurai sword. “The Great Killing” and its companion movies, “13 Assassins” and “Eleven Samurai,” are available on DVD from your local video store; or visit http://www.animeigo.com.